With a long, company-wide history of strong sustainable product development and practices, Johnsonite, a Tarkett company, sought to increase awareness around its ongoing sustainable programs and efforts during the NeoCon® World’s Trade Fair 2010. However, gathering an audience through a static event at tradeshows can be difficult and costly. The company wanted to create an event that created an ongoing buzz at show, gaining them recognition amongst designers, architects and media. The tile sample handouts used during the show were actual pieces of Johnsonite’s rubber and linoleum flooring cut down to various sample sizes. The use of tile samples not only worked to create a colorful piece of art that peaked the curiosity of passer Byers, but they immediately put the product and brand in the hands of the audience. The samples also were used as an interactive tool for the audience to participate in a unique event and to help donate flooring to a worthy cause. Promotion of the event was critical before, during and after NeoCon. In addition to working with Johnsonite to create and execute the event, Function: also worked on developing several promotional items, including a microsite, Tweet cards and Collage stickers. The microsite (www.sustainability.johnsonite.com) was designed to replicate the visual of the collage, with links to Tarkett, Johnsonite and Azrock sites, key product information, sustainable messages, event information and a downloadable press kit. In addition, Function: created an online Twitter campaign for Johnsonite to share sustainable messaging and show information. 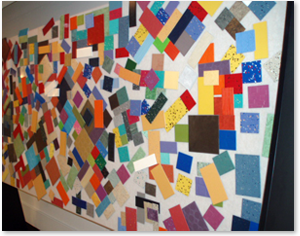 The “Collage of Possibilities” event was also promoted prior to the show via press release and with media during scheduled interviews throughout NeoCon. Due to excellent event attendance, Johnsonite will donate 3,000-square-feet of its Harmonium xf Linoleum Flooring. Architecture for Humanity is a nonprofit design services firm with a network of more than 40,000 professionals that brings design, construction and development services to where they are most critically needed, directly benefiting 10,000 people each year.